Leah Nanako Winkler’s God Said This won the 2018 Yale Drama Series award, judged by a panel of eminent playwrights. It’s tackling a story that’s conventional, but promises emotional heft–a beloved mother battling cancer and trying to bring her fractured family back together by sheer force of will. It’s packed with characters who don’t often appear on the New York stage–a working class non-white family and a well-educated, emotionally intelligent single father, all of them from Kentucky, all of them complicating the all-too-common-these-days mass-media portrayal of the residents of Appalachia/Trump country. And it takes pains to play jokes with the audience’s possible preconceptions about those characters, mixing stereotype with off-center details (a violent alcoholic father with hoarding tendencies also collects beautiful rocks; the guy who casually slurs his heroin-addicted ex is a single father with an MBA). It’s gotten a wonderful production under the supple direction of Morgan Gould. There are many things about this play to admire, and yet I found it intensely frustrating, because I felt like Winkler doesn’t trust her audience to take the emotional journey that the actors and the story lay out; doesn’t believe viewers will understand what goes unspoken when characters’ emotions don’t neatly fit into language. 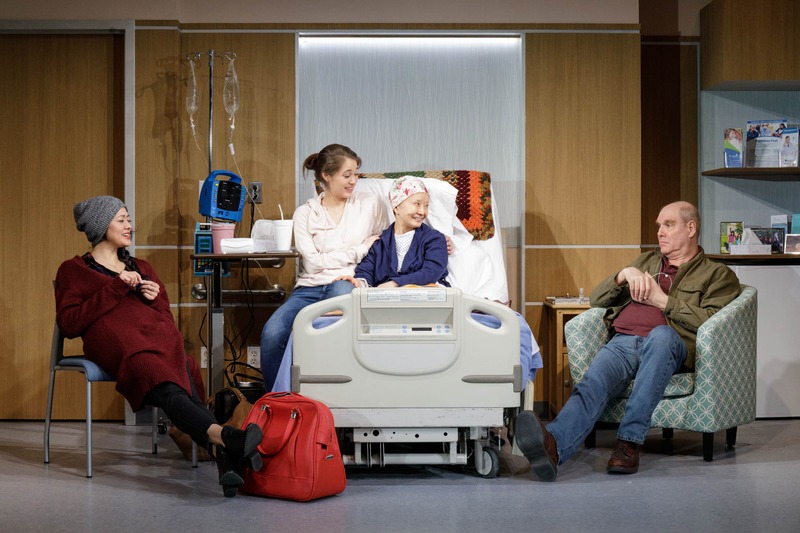 One of the play’s storylines is about a daughter’s attempted reconciliation with a father who isn’t good with words, and yet the script is extremely reluctant to believe its audience will understand or feel anything that isn’t explicitly spelled out, then underlined for good measure. Hiro (Satomi Blair) has been estranged from her father, James (Jay Patterson) for years. She left their Kentucky hometown for New York, and didn’t come home even when James was suffering from liver failure and on the transplant list, because she couldn’t cope with the wounds left by his years of alcoholism and emotional abuse. But now Hiro’s mother, Masako (Ako), is undergoing treatment for a nasty cancer, and Hiro’s sister, Sophie (Emma Kikue), a born-again Christian with heavy financial and emotional burdens of her own, can’t handle it alone. Hiro is home, but not handling the situation well. She keeps disappearing to get stoned with a high-school acquaintance, John (Tom Coiner); they weren’t particularly close back in the day, but social media has kept them more or less in touch, and she really needs an escape about now. All the characters seem a little too uncannily aware of, and able to express, their own emotional states. Even James, who we are told is temperamentally a man of few words, one who’s never been able to tell his family how he feels, is in AA and seems to really relish his moments of confession. (His monologues of AA testimony punctuate the play.) John, not even involved in this family dynamic, is a man of considerable transparency, with seemingly no filter on either his positive or negative emotions. There are so many moments that could have more impact if treated with more restraint, if both the audience and the excellent ensemble were trusted to read subtext rather than being spoon-fed each emotional beat. To be sure, the characters are in a moment of crisis, buoyed by the clarity and the desperation of both facing death and trying to make up for a lifetime of mistakes. Still, crisis doesn’t magically give people self-knowledge, or eloquence, as it too often seems to here. The patterns and symmetries, too, start to feel schematic: John’s strong parenting juxtaposed against James’s failures; Hiro’s life of lonely financial success elsewhere against Sophie’s staying home, settling down, and struggling financially; James’s miracle cure against Masako’s brutal struggle. And what should be one of the play’s most heartbreaking moments is so thoroughly foreshadowed–explained almost word for word a few scenes earlier–that its resolution feels contrived rather than satisfying. Gould wisely steers the actors toward the lightness in the script, making the most of the least predictable moments. Coiner finds enormous humor in John’s skewering of Hiro’s expectations and misconceptions about his life, as does Patterson in James’s belatedly enthusiastic embrace of modern technology. Gould has also done strong work in building the sisterly bond of Kikue and Blair; their body language and physicality align in a way that marks them as family, raised in the same way despite their differences, and they’re never more connected than in a late scene where they get stoned together and then go back to the hospital. Ako makes the force of Masako’s optimism almost palpable, born of strength rather than naivete. This lightness gives a necessary contrast for the darker emotions, but Blair and Patterson handle the shift better than the other actors; their argument over one of James’s rocks hits home in a way some of the quieter, ostensibly sadder moments don’t. So it’s not that the emotions never hit; you’d need a heart of stone not to be touched by the characters’ struggles and losses. But still, a powerful piece of theater, from the most experimental kind of avant-garde work to the kitchen-sink-iest piece of naturalistic dramaturgy, depends on a relationship of trust with its audience. This may seem like a ridiculously obvious truism, until you’re in the room watching a play that seems over-explains plot points and characters’ motivations in a way that saps its potential impact.